Recently published in the American Malacological Bulletin, an update on the terrestrial mollusc fauna of the state Chiapas, Mexico (Naranjo-García & A.G. Smith, 2014). This is a paper which has some well-documented tables (localities per species, with sources and depositories) and an analysis of the terrestrial malacofauna per physiographic region inside the state. Other than a schematic figure of these regions, there are no further illustrations. Naranjo-García, E. & Smith, A.G. (2014). 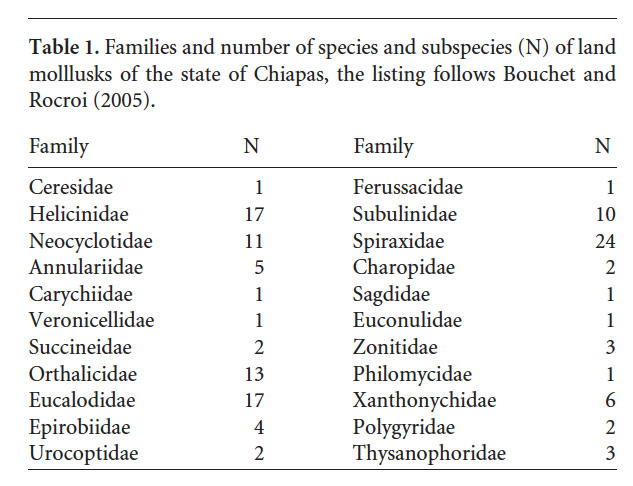 Update on the terrial mollusks of Chiapas, Mexico. –– American Malacological Bulletin 32: 32–51. This entry was posted in Uncategorized and tagged literature, mexico on March 12, 2014 by bramb.